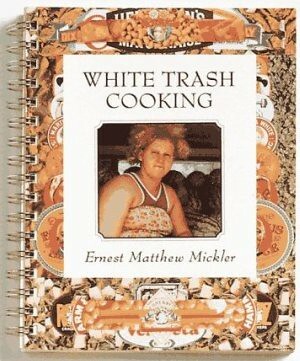 Let me preface this by saying I mean no disrespect, but Barnaby has this hilarious cookbook called White Trash Cooking. While I have been known to eat Little Smokies and SPAM, I had never heard of some of the 'delicacies' listed in this fine publication. I've never called it a "toe of garlic,"
I'm concerned why this is best prepared in a black dutch oven. Will my white-bottomed one not work? First you take a live cooter and wait for him to stick his head out from under his shell. When he does, you grab it and whack it off. Take a hatchet to the underside so you can get to the meat and remove it along with the liver, tripe and eggs (if he has any?). Set aside. Fry all the the above down until it's browned, then add the cooter and continue to cook. It's best in a black iron dutch oven. Don't forget to salt and pepper it to your taste. Brown the flour in an iron frying pan. Stir constantly to avoid burning. Bake sure you brown it good. Then add it to the cooter with enough water to make it soupy. Stew down til meat is falling off the bone and the liquid is thick. Now make a biscuit dough and drop small-sized biscuits over the top of the stew. Stick it in a preheated oven at 400 degrees and bake until done (golden). A hunter will come out of the woods to get this! The recipe that follows in the book is Mock Cooter Soup. Cooter's good enough to have a mock version? I'll stick with chicken, thanks! I love reading this cookbook, and have made a few tasty treats from it. The Over the Kitchen Sink Tomato Sandwich is a personal favorite. A cooter is a turtle in Southernese. Not sure which species, but I sure wouldn't get near a snapping turtle, cause they are just too dangerous and could take off your toe of garlic with one swipe of its prehistoric head. We named one of our dogs Cooter, which my kids told me much later in her doggie life is a nasty slang expression for a personal part of a woman's anatomy. How many times I called for Cooter without embarrassment I can't tell you. Cooter was the mechanic on the Dukes of Hazzard. He might be a little too greasy to cook. It took my third grader to tell my that yes indeed both male and female turtles lay eggs and that the females only lay female eggs and the males only lay male eggs so believe it or not your "he" cooter may have eggs when you wack him open. this is a bizarrely late comment, but i think that a black iron dutch oven is meant to be a cast iron dutch oven, not one that is necessarily black in color. although i admit that i've never seen cast iron in any color besides black . . .
Be sure to check out TurboWhiteTrash and feel free to submit funny stuff to our site. As a self elected peculiar culinary southern white trash cook a few corrections are in order. First) A "cooter" is indeed a Turtle, more correctly an Alligator Snapping Turtle. These suckers are bad mean and will bite off anything you happen to get to close to their mouths. Second) No self respecting piece of white trash uses any kind of "Dutch Oven" except a cast iron one and if it's not black then you have not; a) used it enough or b) you've washed it with too much soapy water. Most white trash cooks merely take scalding hot water with little or no soap and scour out a cast iron cooking pot or pan. Indeed most cast frying pans appear to have a crust of black around the edges. And just as a point of reference dedicated white trash cooks use cheese and mayo on or in about every dish; however, there is no true mayo other than Dukes brand and Velveeta works in about everything that calls for cheese in white trash dishes (even though there is no scientific proof that Velveeta is even really cheese).